The Obama administration is locked in a last minute bid to save last year's nuclear deal with Iran by promoting the delivery of airliners to the Islamic Republic, despite mass opposition in Congress that has moved the administration to engage in a series of public relations maneuvers and backroom deals meant to secure the multi-billion dollar sale, according to multiple sources familiar with the administration's thinking who spoke to the Washington Free Beacon. 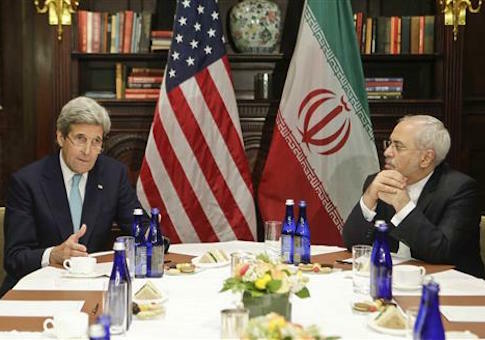 The Obama administration has been scrambling for weeks to provide Iran with assurances the United States will continue to grant Iran vast relief from economic sanctions and help push through deals with Boeing and AirBus, American and French airplane manufacturers, respectively. The effort comes as the nuclear deal hangs in the balance following a flood of Iranian threats and the election of Donald Trump, a vocal opponent of the deal, as well as several new moves by Congress to increase pressure on Tehran's global terror operations. Boeing confirmed Monday it sealed a $16 billion deal to sell Iran 80 jetliners, an announcement that sources told the Free Beacon was meant to provide momentum to the nuclear deal and stop Tehran from walking away. Multiple sources familiar with the situation told the Free Beacon the administration is promoting a false prognosis and that the pact is likely to collapse by next year, when President-elect Trump assumes control of the White House and is partnered with a Congress that is more than willing to put a kibosh on the sale, which lawmakers say will embolden Iran's terrorist forces. "The Obama administration oversold the deal to the Iranians by secretly promising to relieve a range of sanctions that Congress was never going to agree to," said one senior congressional adviser apprised of the White House's thinking on the matter. "The administration then did everything it could do unilaterally, including lifting restrictions on military assets and ballistic missile banks, to try to make good on those secret promises," the source said. "But Congress was never going to allow Iran to steamroll across the Middle East, even if the Obama administration was willing to look the other way, and so the deal was always going to collapse under its own weight." The State Department would not provide more details about the deal, including how it is being financed, by press time. Tehran has a long history of using its national air carrier, Iran Air, to ferry weapons and support to terror groups across the region, including in Lebanon and Syria. Despite these concerns, the Obama administration has fast tracked special licenses permitting Boeing and AirBus to move forward with the sales without violating sanctions barring such agreements. Experts have repeatedly warned that Iran Air could easily resell these planes to other Iranian airline companies still targeted by sanctions for their illicit activities. David Pasch, a spokesman for Rep. Peter Roskam (R., Ill.), who has worked to block the plane sales to Iran, told the Free Beacon that Congress will have an easy time killing the deal next year. "We will aggressively fight this deal next Congress, though we probably won't even need new legislation to do it," Pasch said. "The incoming appointees at Treasury and State will no longer report to a White House willing to bend over backwards and ignore national security concerns to keep Iran from walking away from the nuclear deal." One senior congressional aide who works on the issue told the Free Beacon that the flurry of recent news stories casting the deal as a lock is part of a public relations campaign by the White House meant to given the appearance the deal is set in stone, despite multiple obstacles standing in the way. "The administration is creating a facade of false assurances to assuage Iranian concerns about completing these sales," the source told the Free Beacon. "They want, in essence, to make this a fait accompli. In reality, there are a number of obstacles in the way of completing this deal. For example, the House has already passed legislation to cut off Ex-Im [export-import] financing for aircraft sales to Iran. I think with a Trump administration we can reasonably expect renewed movement in Congress to block these dangerous deals." The planes are not set to be delivered to Iran until 2018, meaning that Congress and the next administration have a couple years to disassemble the deal. There also remain questions about how these Western companies will get financing to seal the deal with Iran, which remains a safe haven for terrorist financing. These obstacles are expected to grow more daunting under a Trump administration, which has discussed increased transparency for companies willing to deal with regimes that sponsor terrorism such as Iran. Another issue of top concern to opponents of the sale is a carve out guaranteeing Boeing engineers work with Iran to provide spare parts and technical know-how, a move that immunizes Tehran from future sanctions targeting the airline sector. "The Obama administration created a fantasy world in which it's safe to sell airplanes to Iran, then pulled Boeing into that fantasy world," said the congressional adviser quoted above. "But it's not safe to sell airplanes to Iran, because the Iranians use their airplanes for all sorts of illegal things, including arming Syria's war machine. That's why the sale stalled, because no one wanted to touch it. But the administration is desperate to make it look like the sale was moving forward, so that when it collapses they can blame it on Trump."